Brilliantly acted, well directed drama that’s both extremely moving and full of warmth and humour. In America is writer-director Jim Sheridan’s first film since The Boxer in 1997. With a Tarantino-like gap between projects like that, no-one could accuse him of being prolific but the time has been well-spent, because In America is an enjoyable, heart-warming, brilliantly acted drama that, if there were any justice, would net a whole bunch of Oscar nominations for its talented cast. Co-written by Jim Sheridan and his two daughters, Naomi and Kirsten, In America is a semi-autobiographical tale about an Irish family who move to New York to start a new life, following the death of their young son. It stars Paddy Considine and Samantha Morton as Johnny and Sarah Sullivan and real-life sisters Sarah and Emma Bolger as their daughters, 11 year old Christy and 7 year old Ariel. In a telling scene at U.S. customs, both parents are asked how many children they have. Sarah says two and Johnny says three, indicating that he still hasn’t moved on, so their ‘new life’ involves both physical and emotional hurdles to overcome. Johnny, in particular, has lost his ability to be playful, though he knows he has to be there for his family. This emotional distance is first tested and then, gradually, repaired when the two kids befriend their downstairs neighbour Mateo, played by Djimon Hounsou. Narrated in part by Christy, the film also makes use of her camcorder footage to occasionally allow more intimate glimpses of the family. It also makes great use of location and is careful to present a realistic portrait of New York, from their rundown apartment to their various neighbours etc. 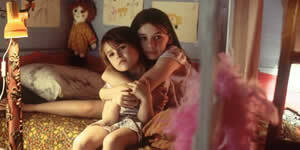 The acting is superb, particularly from the two girls, who give impressive, natural performances. Morton is already well-known in the States, but Considine’s performance here should ensure he gets the recognition he deserves after his sterling work in films such as Last Resort and A Room For Romeo Brass. It’s also nice to see Djimon Hounsou finally get a decent part after a string of thankless ‘Noble Tribesman’ roles (Four Feathers, Lara Croft 2). The film is packed with great scenes and memorable moments – the scene where Johnny tries to win an E.T. doll for Ariel at a rip-off fairground stall is a heart-stopping highlight. There’s a lot of gentle humour in the film, too, such as in the scenes with the two kids playing Trick or Treat, or Johnny’s Herculean quest for an air-conditioning machine. To sum up, this is a well-made, enjoyable drama that’s both moving and funny, with terrific performances from its cast. Recommended.